Other details like educational qualifications, age limit, selection process, application fee and how to apply are given below…. 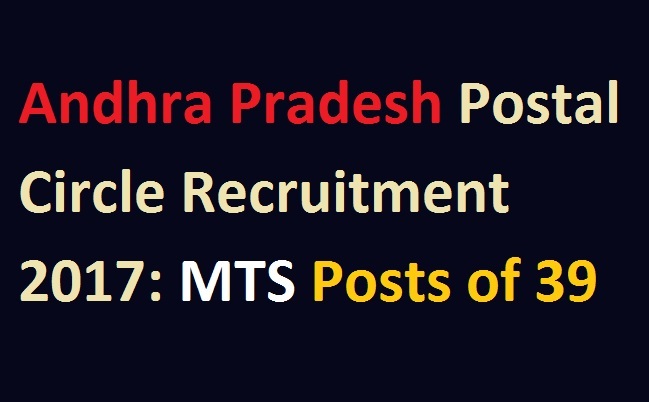 AP Postal Circle Recruitment 2017 :Educational Qualifications: Candidates should possess Matriculation or ITI from a recognized Board or University. AP Postal Circle Recruitment 2017 :Age Limit: Candidates age limit should be between 18 to 25 years as on 18-09-2017. AP Postal Circle Recruitment 2017 :Age relaxation is applicable 05 years for SC/ ST, 03 years for OBC, Ex-Serviceman, 10 years for PwD-Unreserved, 15 years for PwD+SC/ ST, 13 years for PwD+OBC candidates. AP Postal Circle Recruitment 2017 :Selection Process: Selections will be based on written test. 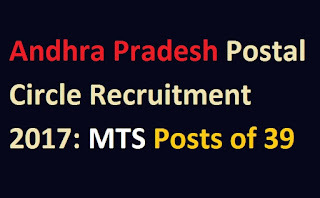 AP Postal Circle Recruitment 2017 :Application Fee: Candidates should pay Rs. 100/- Application fee + Rs.400/- Examination fee at any Head Post Offices. AP Postal Circle Recruitment 2017 :Candidates belonging to SC/ ST/ PwD/ Women are exepmted from payment of Examination Fee. AP Postal Circle Recruitment 2017 :How to Apply: Eligible and Interested candidates may apply through online.